Select the station to view the past 7 days 24hr-PM10 Concentration in Singapore. 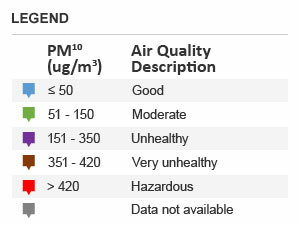 PM10 refers to particulate matter of 10 micrometers or smaller in size. Examples are smoke, haze, dirt, dust, mold, spores and organic compounds. These particulates originate from anthropogenic activities such as burning of fossil fuels, industrial processes, or may be released from natural sources like volcanoes, forest fires and living vegetation.